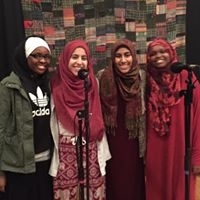 Four Vermont Muslim teen slam poets who call themselves Muslim Girls MakingChange will discuss their experiences at a One World Library Project program. The teens, who are juniors at Burlington and South Burlington High School, perform slam poetry to express their passionate concerns. They will present and discuss their work at a free event hosted by the One World Library Project and sponsored by Five Town Friends of the Arts. Dedicated to social justice, Muslim Girls Making Change (MGMC) is a youth-led group created by Hawa Adam, Kiran Waqar, Lena Ginawi, and Balkisa Abdikadir. All four grew up in Vermont, though their cultural roots include Pakistan, Yemen, Egypt, Kenya and Somalia. “The voices of young Muslims, particularly African American Muslims, aren’t heard all that much,” explains Kiran Waqar. “People put us in boxes and get blocks around what we look like.” Through performance, the group dispels stereotypes about Muslim women and advocates for positive change. Muslim Girls Making Change was formed almost a year ago. Last February they started writing after hearing about Brave New Voices International Youth Poetry Festival in Washington, D.C. The students were already involved in a range of advocacy work and got excited about reaching a broader audience. “Slam poetry allows us to be heard about issues we care deeply about,” says Waqar. “Hijab 101” by Kiran Waqar and Hawa Adam, excerpted below, explores the authors’ experience as Muslim American women. For more information on this event or about One World Library Project, contact the Lawrence Memorial Library at 453-2366 One World Library Project Facebook page. One World Library Project is a local community non-profit that “Brings the World to our Community” through regular programs as well as a collection of adult and children's books and films about world cultures, all of which can be found at the Lawrence Memorial Library. The library’s online catalog has a full listing of OWLP items available for checkout.